Yesterday my art experience started while I was compiling some photo galleries. I received an email that said "Free gift bag" so you know I was out the door in a flash. I just had to stop by the Surface Lounge (Surface Magazine) on the rooftop of the Gansevoort Hotel for my Art Basel gift bag. Apparently I was just one of very few who responded to the email so quickly and a good thing as there were only eight gift bags. I grabbed one, took a few photos and left. 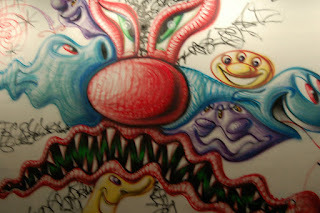 Last night my Art Basel journey took me downtown to Wynwood and the Miami Design District. The first stop was at the Wynwood Walls which was a street mural park with works by 15 internationally respected artists like pop artist Kenny Scharf, Stelios Faitakis from Greece and Os Gemeos (twin brothers) from Brazil. 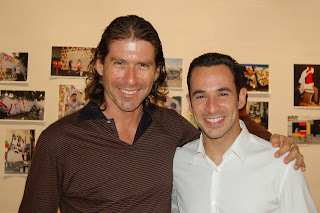 There I photographed racecar driver Helio Castroneves (who won Dancing With the Stars). After that we wandered in and out of the many galleries, viewing art, chatting with friends, and eating the snacks. 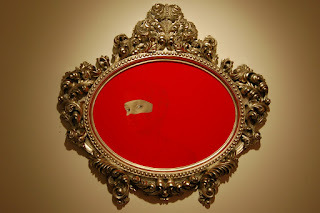 We went to see Christopher Ciccone's exhibit at Avant Gallery but he had already left so I took photos of his work. We headed over to Dot 51 Gallery but it was closed but were welcomed by Mamuska at Mamuska's Art Cafe. We checked out the art and chatted with Mamuska who made us delicious pasta with salmon and white sauce. We wandered through a view more galleries including Eyes Wide Shut (lots of photography) then came back to the Beach. Because I've been out every night on art expeditions I must spend all day writing or maybe I should just take a nap as tonight is filled with more art events. There's three more days of Art Basel remaining. Until tomorrow. Photos: Art by Salustiano, Howard Srebnick & Helio Castroneves, Kenny and Scharf mural.